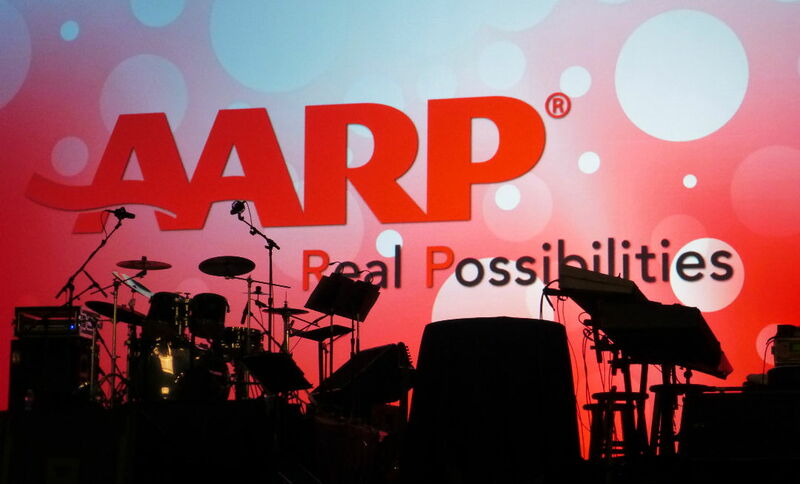 Every year, the AARP holds two national conventions (one in the spring and one in the fall), called Life@50+. 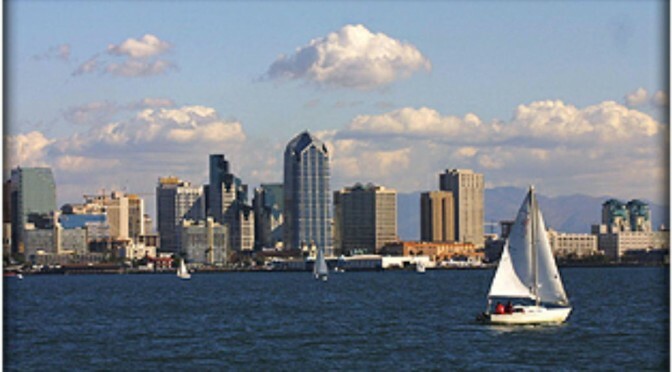 The host cities change each year; for 2014, Boston and San Diego will host. The spring event, scheduled for May 8 – 10, will be held in Boston. 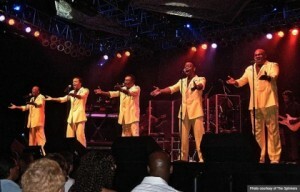 · The “Oldies Concerts” are prime entertainment: Both Friday and Saturday evenings offer special guest artists. The Spinners / Mary Wilson (one of the Supremes) will perform on Friday – with a big dance floor available to get your groove on – and the Moody Blues are scheduled on Saturday. · Celebrity appearances: This year in Boston, some of the big names you may see presenting include Whoopi Goldberg, Jay Leno, Dan Marino, Cuban-American musician Emilio Estefan, Linda Ronstadt, and Captain Richard Phillips (of the pirate-hijacked MV Maersk Alabama). You may also see an interview with Laura and Barbara Bush. · Lifestyles Sessions: Sessions offered this spring include topics on travel, retirement financing, health care, the “pursuit of happiness,” and – always a favorite – the Movies for Grownups Film Festival. · An opportunity to develop new relationships: Attending a gathering of 50+ individuals from across the country can lead to new friendships or networking opportunities. Over 12,000 Baby Boomers are expected to attend. You may even meet some travel buddies for your next retirement trip! · Information regarding new health innovations: See how technological advances in healthcare and communications can improve your life. 10 different leaders in the health technology industry will be in Boston to participate in the “Health Innovation@50+ LivePitch” session. · Over 400 exhibitors: The exhibition floor will be packed with booths exhibiting senior-friendly products, services, and special deals for AARP members. Of course, simply taking a trip to Boston can be an enticement in itself. 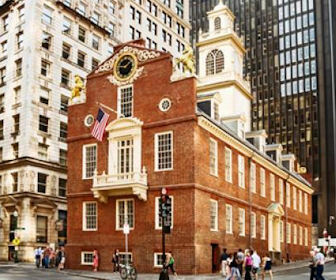 Boston offers a number of tours and attractions, including an Old Town Trolley Tour, the New England Aquarium, the USS Constitution, Chinatown, the Spirit of Boston Lunch Cruise, or a luxurious day trip on the Cape Cod and Provincetown Ferry. Best of all, the Life@50+ convention is extremely affordable! General admission to the entire 3-day event is only $25. If you are ready to plan your trip to Boston this May, go to Life@50+ Boston to start the registration process today. The Boston LifeAt50+ event was back in May and was our second. We had a great time and it appealed to us as much this time as the first time we visited this event. Now looking forward to San Diego in September 4-6, 2014. This time it will be actually called IdeasAt50 San Diego. Looking forward to seeing what new ideas and interesting things we can learn. The post below was pre Boston but I am sure allies to San Diego also. Get more info here on IdeasAt50 in San Diego. It was only last September that we attended our first AARP Life@50+ Event in Atlanta; now we are planning on attending the next one in historic Boston Massachusetts May 8-10, 2014. Life@50+ is a very poplar national event held twice a year, in the Spring and in the Fall. I would expect over 13,000 baby boomers will be joining me in Boston for this event. There are several good reasons to head to this Lifeat50 event in Boston. 1. It is in Boston! Boston is a great city to visit. We love walking around Boston especially the Faneuil Hall district and downtown. The Lifeat50 event will be held at the Boston Convention & Exhibition Center, near both. Also there are wonderful restaurants and you will love the seafood! What a great opportunity for a little boomer travel to a great city. See our Pinterest for Lifeat50 Boston. 2. You will see more than 400+ exhibitors on the huge convention floor, with products and services especially appealing to us baby boomers. Plus you get enough freebies to fill a shopping cart. You get to learn about the AARP discounts and deals only available to AARP members. I had no idea about many of them. You can ask questions and try out products with no sales pressure at all. These vendors are there to educate you about their products and services. Many AARP vendors have informative presentations and these gather a crowd quite quickly. 50+ AARP perks are everywhere! 3. 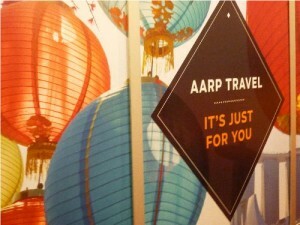 AARP Travel Center– The next generation web site to help you anticipate and plan your travel. I previewed this and it should be ready soon, in the meantime the current site is a handy place to begin. Samantha Brown AARP’s travel ambassador usually attends the Lifeat50+ events and speaks a few times about her favorite subject: travel. 4. Well over a hundred live presentations to see. Three or four stages set up for various presentations going on all during the day. You will want to keep your AARP Pocket Guide handy for the time and places of those which interests you. 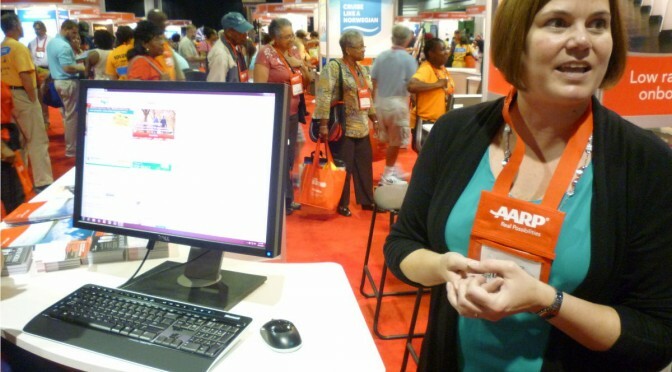 Every hour there are technology workshops in the Exhibit Hall at the AARP TEK Pavilion about how to use technology to connect with friends, family and new discoveries. Subjects like new smartphones, tablets and apps, new social media sites and the like are popular. Technological advances in healthcare presentation by companies who are developing new products to help us age well. More than 50 lifestyle presentations and workshops are planned and will be well attended. 5. Entertainment is another reason you will like Life@50+ event in Boston. 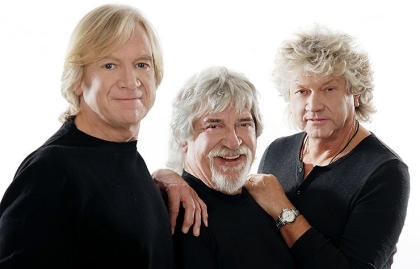 The Moody Blues is booked for Saturday, May 10, 2014 at the convention. Hear Justin Hayward sing “Tuesday Afternoon” and “Your Wildest Dreams”. Baby boomers always have a wonderful party at these shows. 6. Life@50+ Dance Party – The Spinners and Mary Wilson of The Supremes will have the groove going and a large dance floor will be provided for a very energetic baby boomer dance party!! Then you have the several general sessions with more than a few national celebrities and dynamic speakers. I heard Whoopi Goldberg interview Tyler Perry at the last event. This just in: At Boston Whoopi will be talking with Jay Leno on stage. Also on stage will be Linda Ronstadt, Captain Richard Phillips and HGTV stars of Kitchen Cousins Anthony Carrino and John Colaneri. Laura Bush and her daughter Barbara Pierce Bush will be speaking in Boston among others. Check out and track this event at Lifeat50+ Boston on Pinterest. For more information and to keep up with current news, click here for Life@50+ in Boston. Member registration is unbelievably only $25 for this three day event. Time to check out the registration and hotels. See you there! Continuing the Baby Boomer News for this edition, I scanned the baby boomer headlines for this week for interesting stories. I like the ones with news about baby boomer generation’s current lives and also boomer trends. I say for us because I am age 65 and one of the older boomers myself. So here is a quick look at news affecting baby boomers. The rift between Baby Boomer Generation and other generations. Testing for Hepatitis C – has been covered. Today I was blessed to be able to share a story with a young lady about one of my Christmas trees from years ago. There have been trees in my many years. I remember one as a child that will always stand out in my mind. My Daddy went out into the country and dug up a very small tree. He brought it home. He then filled an old tin coffee can with soil and planted the tree in it. My mother put an old white sheet around the bottom for the skirt which covered the can. Then we popped popcorn in a skillet. Yes, I did say skillet not a bag or popcorn maker. With cake coloring it is amazing how you can change the color of popcorn. After the popcorn cooled, my mother made strings of it by using a sewing needle and tread. We wrapped that around the tree. I make a paper angel and attached it to the top. We painted a few pine cones that we had found and hung them on the tree with safety pins. Since my Daddy was very afraid of fires, he attached one string of lights only which we could turn on just briefly. As we received Christmas cards we attached them to the tree. This was a special tree. As a child, I was very proud of it. My sisters sent presents from the big city of St. Louis for me. They lay underneath and of course I had to shake them a time or two before Christmas morning. 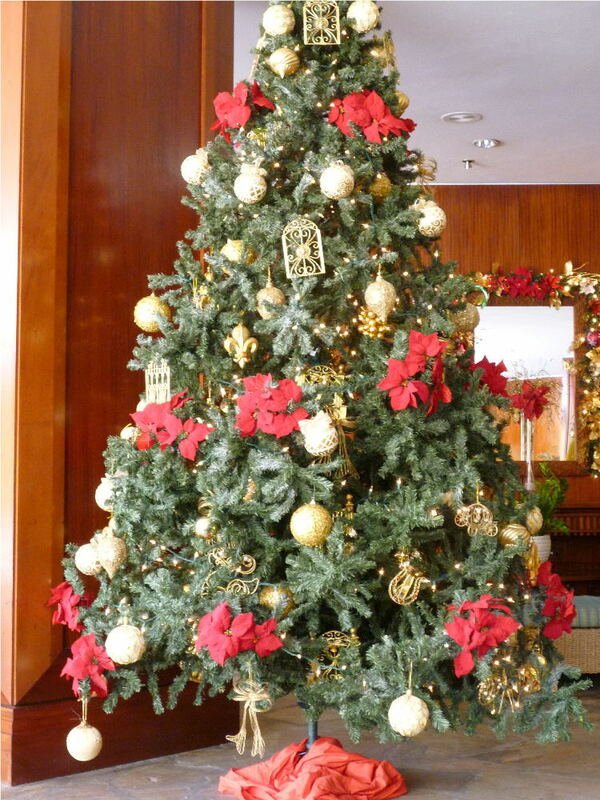 Do you know, I can not even remember anything about gifts that year but I will always remember the tree. When Christmas was over my Daddy some how planted that tree in the front yard of our little rented house. He had a green thumb and loved to keep a beautiful yard. It was always mowed, had flowers, and a couple of wonderful shade trees. Each year that little Christmas tree grew bigger and bigger. He would trim it and keep it in beautiful shape. When I was pregnant with my first child, he took a picture of me and my mother standing in front of that magnificent tree. I still have the old black and white picture. It is dear to my heart. That has been many years ago. It is a memory not of a gift but of one small something of good that I can remember my father doing for me on Christmas. 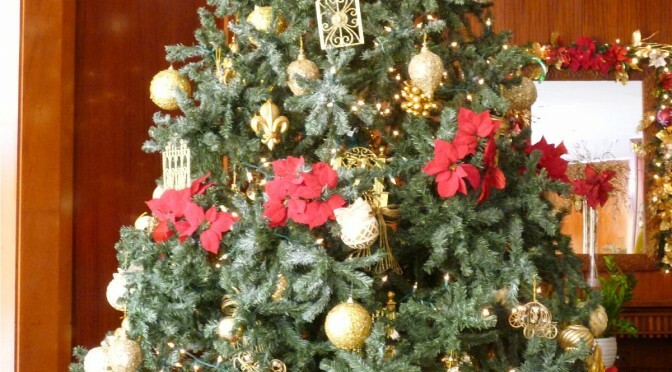 This holiday some may have beautiful large trees, lots of lights, fancy ornaments. and many gifts. Some trees may be real and smell of pine. Other trees may be artificial. Others may have no tree at all. Know matter if there is a tree or not, just remember that Christmas is about the love that we carry in our hearts. Like my Daddy who kept the little tree alive, my wish for you is that you keep the LOVE alive in your heart so that you can cherish that memory. May you always cherish the Memory and hold it near to your Heart! I know Thanksgiving is over and I personally don’t like to dwell on Holidays too long but I have an observation after spending Thanksgiving yesterday with a group of people: baby boomers are their own family. Mary Ann and I went to our friends David and Tina’s for Thanksgiving and was joined by a group of our own age ranging from age 60 to 70+. Four singles, three women and one man. Two of the ladies brought their moms, one of which was turning a spry 90. We had only met one of the others besides the hosts but we hit it off and had a great time talking about all kinds of things. 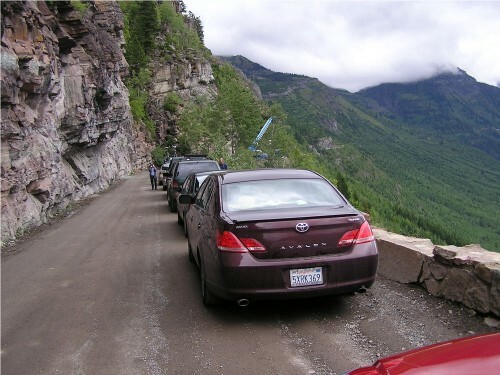 Backing up my recent thoughts about boomers liking to travel we heard about a trips just taken with Road Scholar to Portland Oregon and then California. Another, the gentleman, had just returned from a cruise and land excursion trip to Alaska. Of course I had to tell about our British Isles cruise in August. We were excited telling each other about our trips and other stories about what is going on in our lives. We liked talking and sharing each others company. We chatted and talked about getting older with a huge dose of sense of humor added. I think we talked about wrinkles, assisted living, taking care of parents, medicare, becoming our parents, our homes, cats, what we are eating for a healthy lifestyle and plenty more, all with laughter and maybe a glass of wine. Just baby boomer living. We were like family. We greet each other, accepted each other, and related so well. We shared so much in common. Two married couples, six singles, three males, 7 females. We have other boomer friends that would have fit right in. Other friends who are single, have no kids, have no kids or relatives in the areas, or those who do not for whatever reason have a working relationship with their relations. I think there are quite a lot of fellow baby boomers in this situation. The party didn’t need to be larger but I could image this same type group of boomer friends getting together for other holidays and occasions all over the country. This may be a trend in the making. Boomers getting together and sharing the holidays. I have just written about house sharing by baby boomers and I could easily see this group, or part of the group, living happily with such an housing arrangement if they desired. This would be an excellent way to age in place. 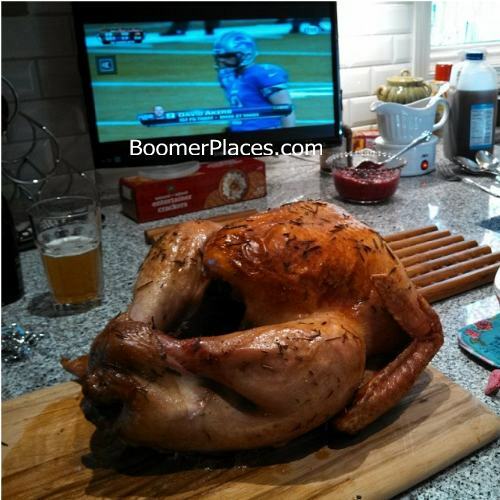 How about you, have you shared the holidays with your boomer friends?